Now that we have discussed the team who works on your custom home from design through installation, let’s talk about the materials used to build your home. M.T.N Design and PrecisionCraft Log & Timber Homes use better building materials to construct the structural shell of your home. In addition to creating highly energy efficient homes, these materials are the final piece of PrecisionCraft’s Total Home Solution(SM). PrecisionCraft uses the Advantage ICF System® for its foundations. 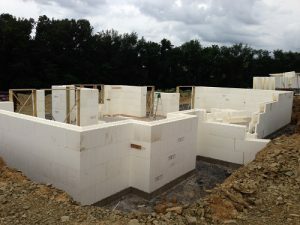 An insulating concrete form (ICF) combines two panels of expanded polystyrene (EPS) connected with patented web connectors molded into the EPS insulation. Often used to make coffee cups, EPS is an air-filled, closed-cell foam. For this reason, the R-value of EPS does not change or degrade over time. Because the ICFs interlock at the top and bottom edges, the forms line up for ease of drywall installation and to provide continuous insulation. Once the ICFs are formed into the shape of your foundation, they are filled with concrete to create an energy efficient wall. In addition to the advantages listed above, the effective R-value of a wall formed with the 8” Advantage ICF System® is approximately R-22.7. As a point of reference, a typical 8” concrete wall with 2″ x 4″ framing and R-14 batt insulation provides an effective R-value of 11.7. When compared, the Advantage ICF System® garners a 193% increase in effective R-value over batt insulation. (Advantage ICF, 2017) As a result, the additional effective R-value will lower utility costs and provide you with a more comfortable living environment. Radon gas comes from the natural decay of uranium found in nearly all soils. Identified as a contaminant, radon gas affects indoor air quality worldwide. To mitigate radon gas, PrecisionCraft offers a two-in-one solution called Radon Guard™. 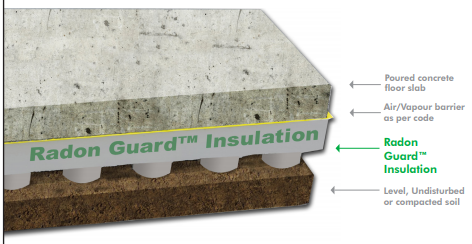 Radon Guard™ provides insulation at the base of your foundation while creating a safe method for expunging radon gas. Installed under your home’s concrete slab, the interconnected channels of the Radon Guard™ face downward. This allows for the collection of the radon gas in the sub-slab space before it enters your home. Then, a radon mitigation system exhausts the gas. 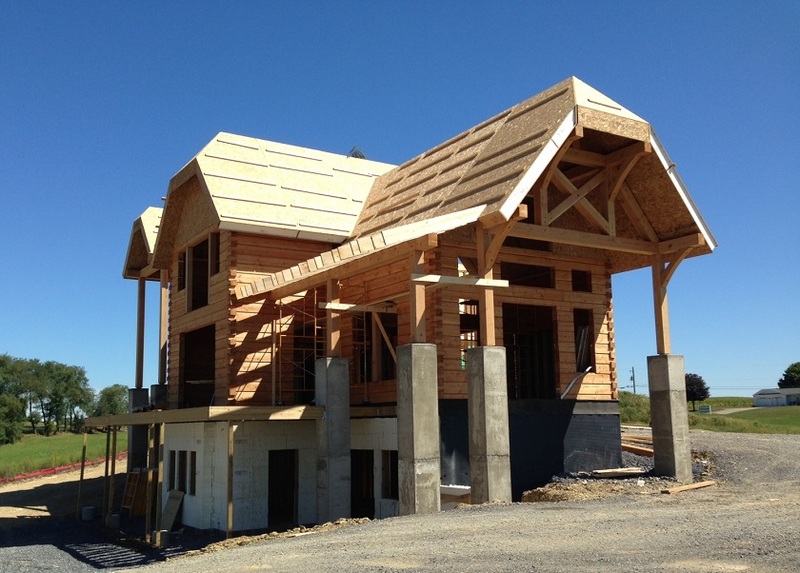 The log and timber skeleton, and walls of your new home are installed after the foundation. While the materials used for your custom home’s walls will vary depending on your design, there are a few items PrecisionCraft incorporates into its homes. For timber frame as well as post and beam skeletons, PrecisionCraft uses Timberlinx to supplement every joint. With Timberlinx, a connection tube is inserted into both joint members and linked together with expanding cross pins. Because it is internally installed, Timberlinx preserves the appearance of the joint while adding strength to the log and timber skeleton. For handcrafted and milled log homes, PrecisionCraft uses the Houseal Non-Settling (HNS) System™. With the HNS System™, a column of steel pipe coupled with pins holds each log in place. The HNS System™ helps prevent the compounding effects and maintenance associated with traditional settling log systems. To learn more, please read the blog about the Houseal Non-Settling System™. The final piece of the structural shell is Insulspan® structural insulated panels (SIPs). SIPs are installed as wall and roof panels depending on your home’s design. 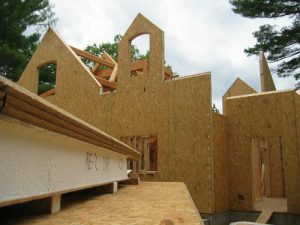 The SIPs are created by structurally laminating a continuous core of expanded polystyrene (EPS) insulation between two performance-rated oriented strand boards (OSB). Then, the panels are precision-cut to exact design specifications in a controlled manufacturing environment. After installation, the Insulspan® SIPs continue to provide advantages over other construction methods. The high R-value of the SIP panels and continuous core of EPS minimize air leakage and heat loss in the long run. This results in high energy efficiency ratings and significantly lower energy costs. Why Should Better Building Materials Matter to You? Your custom home requires thoughtful design and building materials that will stand the test of time. In addition, changing building codes require better building solutions. Finally, rising energy costs warrant more efficient homes. All these reasons are why M.T.N Design and PrecisionCraft use better building materials to meet today’s stringent building codes while providing you with long-term comfort and lower energy bills. The design, manufacturing, and construction of every PrecisionCraft home fully integrates the better building, energy efficient solutions of the Advantage ICF System® and Insulspan® SIPs. The degreed architects of M.T.N Design are familiar with these products and know how to seamlessly integrate them with logs and timbers. In addition, PrecisionCraft’s dedicated project managers coordinate delivery of the Advantage ICF System® and Insulspan® SIPs with your build site readiness. Finally, PrecisionCraft’s installation team includes a Technical Advisor to help your builder with the SIP installation. Using better building materials ultimately results in a more comfortable and healthy interior living environment, and long-term cost savings for you. Ready to start on your custom home journey? Gather inspiration by visiting the photo gallery or viewing floor plans, or contact us to today.